Eugène Henri Paul Gauguin was born in Paris, France on June 7, 1848. His father, Clovis Gauguin was a liberal journalist. His mother was half-Peruvian Aline Maria Chazal, the daughter of proto-socialist leader Flora Tristan. In 1851 the family left Paris for Peru. Many of the intellectuals of the time had to look to the new world to escape the revolutionaries of 1848. The ideas of Clovis Gauguin were not welcome in Napoleon’s France. Only 35 years of age, Clovis Gauguin died of a heart attack on the voyage. Aline Gauguin completed the voyage with the two children and did not return to Paris for four years. For those four years they lived in Lima, Peru. There they stayed with Don Pio de Tristan Moscoso, Aline’s grandfather’s brother. The paradise Paul Gauguin experienced in Peru would influence his later artwork. Peru is a nation with a dry heat and exotic vegetation. At that time, the children would have been indulged because of Don Pio’s power and money. The family was looked after by an African nursemaid and a Chinese manservant. The place was racially diverse with colorful, extravagant dress and brightly painted buildings. This all ended very suddenly for the young boy in 1857 and he would never return to Peru. A civil war in Peru resulted in Don Pio’s family losing political power. Aline returned to France with the children, expecting Grandfather Gauguin to die. When he died, she would receive a small legacy from him. The widow and her children lived in poverty and moved in with Clovis’ brother in Orléans. Eventually, Aline would find a job as a dressmaker in Paris. She left Paul at a boarding school in Orléans. Upon his death, Don Pio granted Aline a large annuity, but his family managed to prevent her from ever seeing the money. At age 17 Gauguin enlisted in the merchant marine. In December 1865 the Lusitano left Le Havre for Rio with Paul Gauguin. After two years in the merchant marine, Gauguin switched to the Navy. During his time in the merchant Marine, Gauguin’s mother’s health was declining. Due to this she changed to semi-retirement in Saint Cloud where a wealthy neighbor of hers would take interest in her and her children. In 1867, while Gauguin was on his longest trip away from home, Aline Gauguin died. She willed the legal guardianship of her children to that neighbor, the businessman Gustave Arosa. In 1871, Gauguin decided that the life of a sailor was not for him. Upon Gauguin’s release from the merchant marine, Arosa secured a position for him as a stockbroker and introduced him to the Danish woman Mette Sophie Gad, who Gauguin would marry in 1873. Gauguin’s artistic leanings were first aroused by Arosa, who had a collection that included the work of Camille Corot, Eugène Delacroix, and Jean-François Millet, and by a fellow stockbroker, Émile Schuffenecker, with whom he started painting. Gauguin soon began to receive artistic instruction and to frequent a studio where he could draw from a model. In 1876 his Landscape at Viroflay was accepted for the official annual exhibition in France, the Salon. He developed a taste for the contemporary avant-garde movement of Impressionism, and between 1876 and 1881 he assembled a personal collection of paintings by such figures as Édouard Manet, Paul Cézanne, Camille Pissarro, Claude Monet, and Johan Barthold Jongkind. In 1882 there was a financial crisis in France. Gauguin lost his job and decided to try to make a living as a full time artist. However, Paris was too expensive for a full-time artist, so in 1883 Gauguin moved to Rouen to be by Pissarro. He spent a year there where he accomplished much in the way of painting. However, financial problems grew during his time there. So, in 1884, he joined his wife in Copenhagen where she had been working as a translator and French teacher to support her and their five children. It was his first experience painting alone. It gave him time to think about his evolving style. His financial difficulties still continued when he returned to France without his wife. 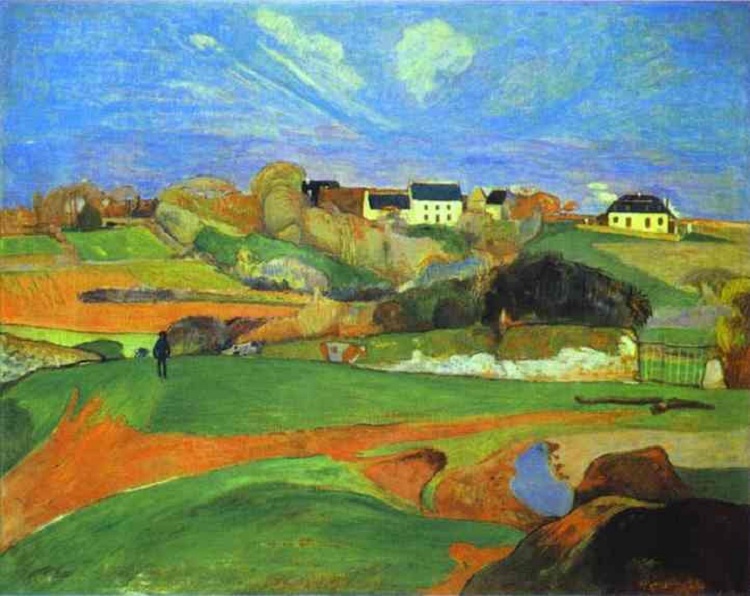 It was 1885, Gauguin continued to paint often but he moved from place to place.